About Holland: Founded in Holland, Mich., in 1929, Holland provides less-than-truckload shipments in the central and southeastern United States and in eastern Canada. With more than 7700 employees, the company has a long history of excellent service, having won the prestigious Quest for Quality award from Logistics Management magazine for 29 years running. Critical Challenge: With a shifting economy after the recent recession, Holland wanted to put greater emphasis on securing new customers. To do that, the company wanted its sales managers to be better equipped to reinvigorate their sales teams. To allow Holland to assess the impact of the program, TopLine customized its 360 Evaluation program. Pre-training assessment: In March 2014, Holland’s sales managers were evaluated on 16 key skills by their sales directors. Sales managers’ skills, according to their Directors, had improved by 23% overall. 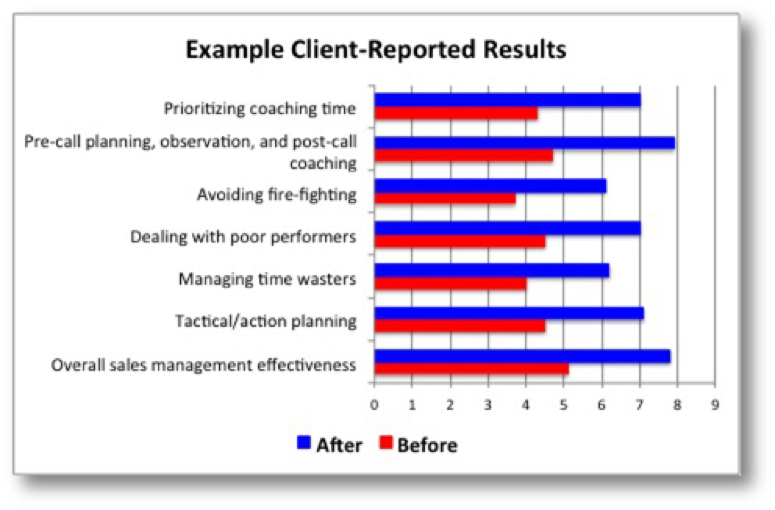 Managers felt they had improved in nearly all 16 skill areas, most dramatically in those related to developmental coaching (diagnosing sales performance problems and doing coaching more regularly) and managing time to enforce business priorities. Client Issue: A sales VP identified a number of dimensions of management effectiveness, then measured his sales managers against those criteria. He was disappointed in the results and wanted TopLine Leadership to help his managers improve across all these dimensions, not just sales coaching. 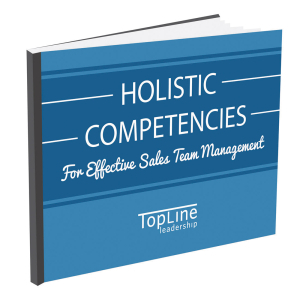 TopLine’s Solution: Our Sales Coaching & Leadership program covers all of the dimensions that concerned this VP. This match between client’s goals and our Sales Coaching & Leadership program happens quite frequently. The results reported by this company six months after the program are shown in the graph below. Client Issue: Sales managers were not coaching salespeople. 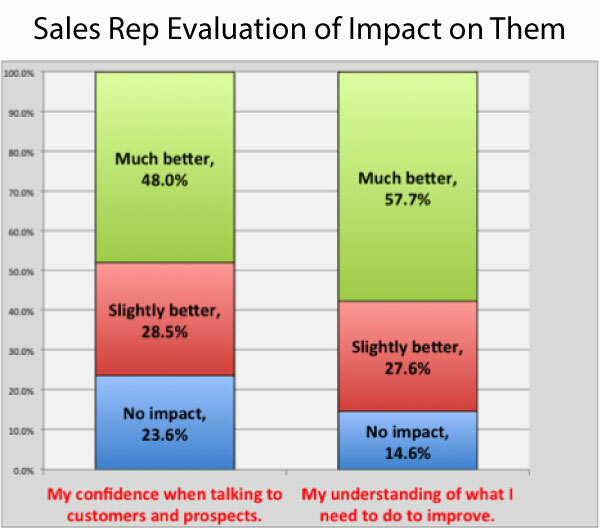 Their attitude towards salespeople was “call me when you need me.” Our client surveyed their sales force, asking salespeople to rate their sales managers’ effectiveness. Interestingly, sales managers were rated very high on “my manager cares about my success,” but were rated dead-last on “provides the proactive coaching I need to be successful.” This lack of proactive, developmental coaching was a drag on sales productivity, and resulted in an unacceptable level of sales turnover. 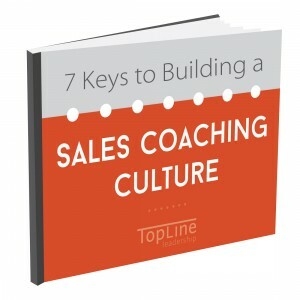 TopLine’s Solution: We customized our Sales Coaching & Leadership workshop. Following the delivery of a two-day “turbo” session to the company’s top 10 Sales VPs, a follow-on program was given to 350 sales managers and sales directors (24 managers per session). Sales rep turnover decreased significantly, and sales productivity per rep went up 20% over the previous year. Client Issue: “Our sales managers don’t understand what we want them to do with their time. Our job description for sales managers is poor.” The VP of Sales sent an email to 10 sales managers asking each to reply with his/her understanding of the sales managers’ duties, and what sales managers thought the company expected them to do with their time. The VP of Sales received 10 different responses, none of which matched what the VP wanted them to be doing. TopLine’s Solution: We facilitated a one-day “job analysis brainstorm session” where a carefully selected small group brainstormed best practices of sales managers and then repackaged these best practices into a new job description. TopLine’s Sales Coaching & Leadership training program was then customized to teach the company’s sales managers the knowledge and skills they needed to perform their jobs. The training also became the forum for senior management to communicate their new expectations to sales managers.